At Kia Marshall, we proudly offer a range of Motability cars and have a dedicated team to take care of the whole process for you. There’s a wide range of cars to choose from through the scheme, all of which are made even more affordable thanks to our range of offers. If you are looking for a compact hatchback, you could opt for the Picanto, Rio or Venga, or step up to a larger model such as the Cee’d for extra practical space. There’s also the options of an MPV and SUV, with the Carens and Sportage available through the scheme. Our offers are designed to help you drive the car that you would like the most, often reducing the cost of the advance payment. From the moment you visit us, to the minute you drive away, we will guide you through the whole process of getting your car. We’ll advise you on the various cars and adaptions, and organise the modifications you choose for you – most of them are free of charge. Then, we’ll set up the finance plan and book your car in for on-going maintenance. The scheme is set up to help disabled people gain independence in the form of a car in exchange for mobility allowance. Some of the cars cost slightly more than the allowance, because they are more expensive to buy, so you simply pay the difference. It’s all covered through simple monthly instalments which also covers insurance and breakdown cover for up to two named drivers and annual road tax. Servicing and maintenance is also included with windscreen and tyre replacements costs built in too. The car you choose will be yours to drive for three years and you have a 60,000-mile allowance. At the end of the three years, you get a new car as long as you are still receiving mobility allowance. We are here to help you drive a new car that’s perfectly adapted to you. Call us or fill out an enquiry form online to arrange an appointment with us and we will guide you through the various deals available. 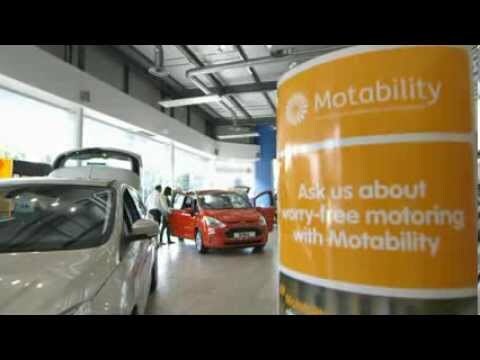 The Motability Scheme enables disabled people to lease a new car, scooter or powered wheelchair by exchanging their Government funded mobility allowance . ... you may be eligible to join the Motability Scheme. This allowance is provided by the Department for Work and Pensions (DWP) and can be used to cover the cost of a Motability lease agreement. As of 8 April 2015, this allowance will be £57.45 per week. To lease a car through Motability, you must have at least 12 months’ award length of the HRMC remaining. This allowance is provided by Veterans UK and can be used to cover the cost of a Motability lease agreement. As of 8 April 2015, this allowance will be £64.15 per week. As part of its welfare reform programme, the Government has started to replace Disability Living Allowance (DLA) with a new benefit called Personal Independence Payment (PIP) for disabled people aged between 16 and 64. The Motability Scheme will work with PIP in the same way as is it does with DLA. As of 6 April 2015, this allowance will be £57.45 per week. A new allowance called Armed Forces Independence Payment (AFIP) was introduced as part of the Welfare Reform Act 2012. Those who receive this allowance will be eligible to join the Motability Scheme. For more information, visit Veterans UK website. As of 8 April 2015, this allowance will be £57.45 per week (this refers to the mobility element, which is the same rate as HRMC DLA and ERMC PIP).